Around my office #2 — Jg. I adore this photo. It was taken in the backyard of the house my mother grew up in. That's her in the foreground, all of two years old, if that, being chased by her father, Kenneth. Their little house was in North Shore, a suburb of Houston; as a kid, we visited often, since we lived just down the road in Channelview. As a young college student, I spent a few months living in the den, which my grandparents converted to a simple bedroom for me. I keep this photo because of the squinty smile on Grandpa's face; though he's younger here, I remember that smile well. And I keep it, too, because my mother is adorable, waddling about, and I like to think of her in this way, the whole of her future still unwritten. To the right is my grandfather's yellow Southwest Football Officials' Association membership card. He used to referee games, though I don't know at what level. College, I'd imagine. I saw a photo of him in uniform once. Football was one of his great loves. He spent as much time stretched out on the floor of his living room, resting on a beanbag, watching games on his old cabinet television, as he did anywhere else. I never loved football, but I sure loved him. Grandpa died in 2003. I was in Washington, then, and he was still in Texas. I was living with my folks, just shy of turning twenty-five, recuperating from a marriage that slid sideways, then pitched over a cliff. I didn't get to say goodbye to him; he wasn't well, but none of us knew he was so near the end until the phone rang. My sister and I were playing a video game together; we heard my mother cry out, and we dashed downstairs to learn that Grandpa was gone. My aunt had called to say they were at the hospital with Grandpa, and it wasn't good; she held the phone to Grandpa's ear so Mom could speak to him. He wasn't conscious, and Mom told me later that she just told him it was okay, he could go if he needed to. And he did, just a moment later. I didn't get to say goodbye, but she did; that she did never made it any easier for her, though. Thinking of him still makes a lump rise up in my throat. 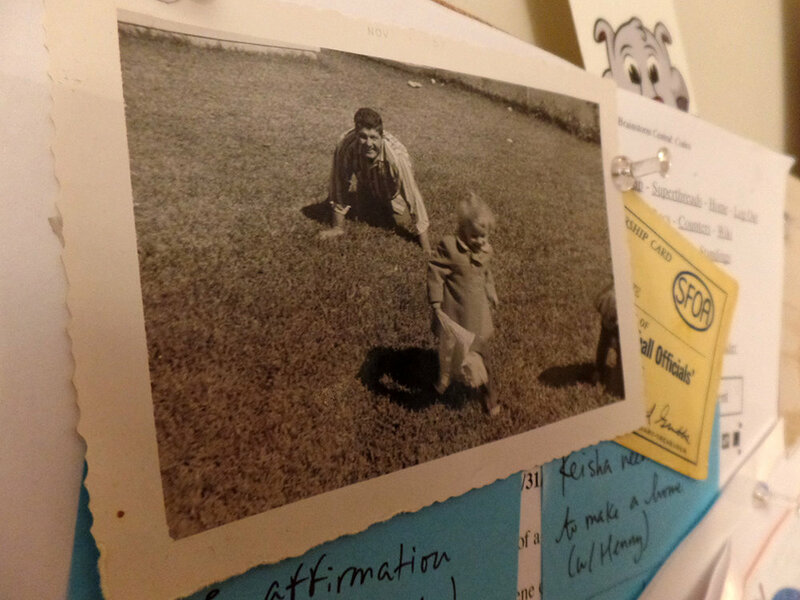 Eighteen months before he died, he asked me if I'd "build him one of those blog things." I set him up on Blogspot, with a simple template, and showed him how to write and publish. He published seven entries over a three-month period, then he stopped. To my amazement, I found that the blog is still online. He never quite figured out how to make the most of it; his entries were brief and unfocused, but captured so much of the easygoing man I remember. It's been a long while since I have graced you all with my delightful chatter. I really don't know what to tell you, yet I'll dream up a brilliant story or article concerning a whole lot of nothing. Spring has sprung, and all that goes with it. But who cares, everyone's got a fancy—if you're a girl, it's boys, if you're a boy, it's girls, girls, and more girls. 'Course if you're old as dirt like me, all that crap is over with. I'm like that old guy who says, "I'm just happy I get a sensation after eating my candy." Oh, well. Like I said, who cares. I've rambled enough. It's time to go. Bye, bye. This photo is a great mystery to me. 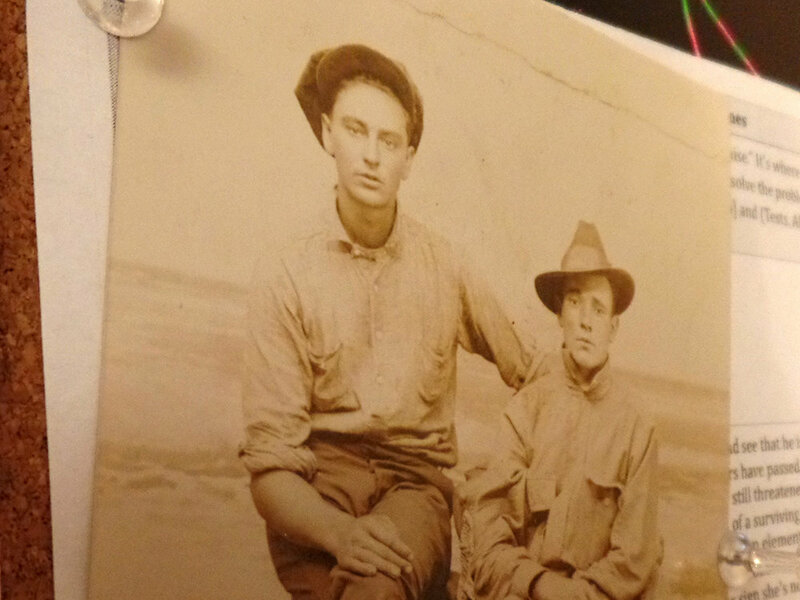 The young man at left is my paternal great-grandfather, Grady. I don't know how old he was in this photograph. My father thinks Grady was fourteen years old or so, but he looks older than that to me. His late teens, perhaps, or maybe even his early twenties. I don't know where he was going, or what he did with himself. I've heard stories, from Dad and from my grandmother, that Grady hopped trains when he was a teenager, traveled all over; he finally stopped riding the rails when he met my great-grandmother, Audrey. I'm not sure who the young man beside Grady is, either. I never knew my great-grandfather all that well. His life and my own overlapped for about a decade. He and Audrey lived in Ace, Texas, then moved, in their much later years, to someplace nearby. We'd visit them, and there would be little to do but read their magazines. I was too young to appreciate the time I had with them, regrettably; I always wanted to dash off and play while the "old folks" talked. When I was nine or ten years old, Grady woke from a nap, then slipped and fell. He died at home. Audrey died six years later, while my family was traveling to Alaska. We stayed a few nights in Canada when we got the news, while my father flew home to speak at his grandmother's funeral. I do wish I knew more of Grady's story. I've always thought there must be something interesting inside the young man in this photo. Who was he? Years and years ago, I discovered this drawing web site. I forget now what it was; some daily doodle thing, where a theme was given, and artists delivered on it. I should remember what it's called, because it's a well-known thing, but...yep, drawing a blank. Wait! Sketch Dailies? Daily Sketch. Something like that. Or Drawn! Or Drawergeeks. One of those sites. Anyway, one of the themes was superheroes, I think, and I spotted the Supergirl illustration above. 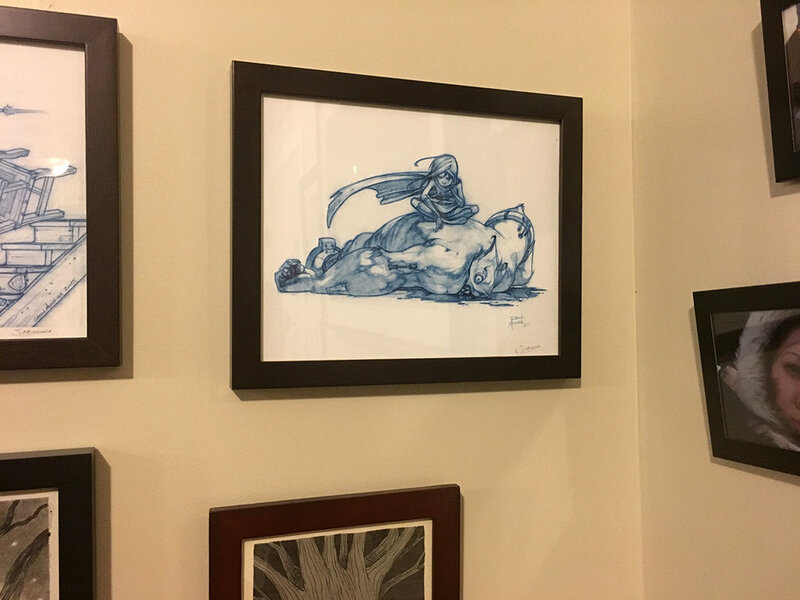 I loved it enough, as you can tell, that it's on my wall, and that I began to follow the artist's work. Her name was Sarah Mensinga, and she'd done some animation work in Hollywood, but her personal illustration blog was a treasure of wonders. Yes, you can see reflections of my office clutter in the glass. Still: isn't it something? I've literally never looked that great in my life. And Sarah captured Felicia and Squish perfectly. I might be the only person alive who believes that Superman isn't Superman if he's not wearing little red undies and that Darryl Strawberry had baseball's sweetest swing. The man was a gazelle in a Mets uniform. I don't remember what made me become a fan of Strawberry, but I was ten or so years old, and he'd caught my eye. When Strawberry was traded to Los Angeles, I begged my dad to take me to Houston Astros games anytime L.A. was on the schedule. We'd sit in right field, and I'd dangle baseball cards over the wall, a Sharpie clipped to a string. Darryl never signed my cards, or anyone's, while on the field, so far as I could tell. He never looked in my direction. I watched him, not the game. He was elegant, fast, wiry, strong. And to top it off, he was a reformed substance abuser who'd turned to Christ, and that's how I sold my devilish hero worship to my family. My bedroom wall was covered with newspaper clippings, box scores and photos of my big hero, and I kept a poster on the back of my door, Strawberry in full torque, swinging for the fences. We visited DisneyWorld one year, and in a gift shop I found racks upon racks of T-shirts bearing caricatures of ballplayers. Lo and behold, I could now wear Strawberry's grinning mug on my body, and I did, until my sister borrowed the shirt and spilled chocolate ice cream on it, forever ruining it (and ensuring we would never talk again). I collected baseball cards like a madman in those days, skipping lunch every day and pocketing my lunch money. I'd spend it on wax packs and foil packs at a nearby convenience store, hoping to pull a Strawberry. I did, of course, but I couldn't afford the truly valuable cards; I was stuck with run-of-the-mill Donruss and Fleer singles. I went to baseball card shows with my dad, where I first laid my eyes on a Darryl Strawberry rookie card, then priced at a way-out-of-my-range $125. But here's the joy of being a grownup with a job and a bit of disposable income: you can finally indulge your inner child's dreams. It helps, of course, if the general value of baseball cards has waned over the past thirty years, and if your hero never quite made the Hall of Fame, or faded a bit in his later career. I bought an unopened box of 1991 Upper Deck cards last year—a whole box, young Jason!—and I pulled a Strawberry single, which you can see at far right in the photo above. It's perhaps the most boring of Strawberry cards ever—not an action shot, just a laughing headshot. But it triggered that old ache in me, and I tracked down those elusive Darryl Strawberry rookie cards on eBay, and now they sit on a shelf in my office, these Donruss, Fleer, and Topps rookies. They're not worth much at all anymore—I bought all three for thirty bucks, though I think the most pristine ones still go for three figures—but they mean a hell of a lot to kid Jason, who would probably sleep with them beneath his pillow.